Internship plays an important role in students’ career.In fact, it is considered to be absolute juggernaut The internship opens a door of success for a student. It gives student a practical exposure that gives him knowledge to deal with problem during the work. It helps you to get a strong grip on the chosen field and gives you an impressive resume as well. Attending an Internship Program before joining any company is highly recommended and necessary in most companies. At BR Brains the internship takes happens twice a year. That is one in the summer season and one in the winter season. They have the same pattern and benefits. It offers the best in class winter training in Jaipur to the computer science students, which is actually a training program that helps them to rise in their career. 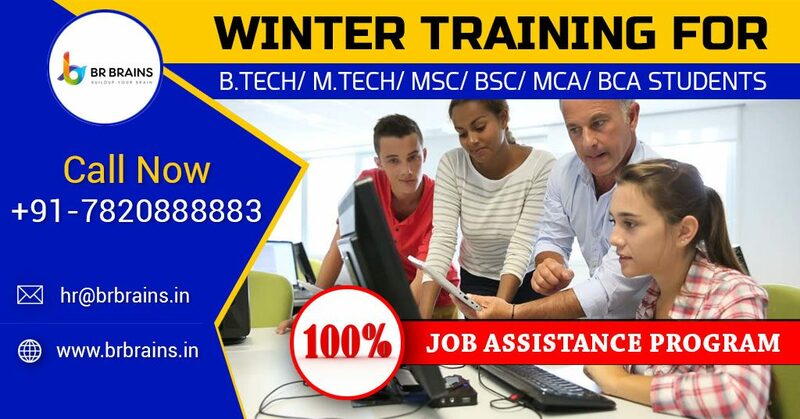 We provide winter internship program in Jaipur for the IT students and as the name says, it is given during the winter season. At the time of the internship, you will come to know about the best IT based concepts and this in turn will help you to know about the learning methodologies which will help you to rise in your career. * Learning from the professional trainer who possess 6+ years of industry experience. * Certificate from BR Softech a renowned IT company. BR Brains also provides training of industry based job oriented courses which include the Android, iPhone, Digital Marketing, web design, Java, PHP, and Dotnet. Thus, by providing training in the courses it prepares the students for the job and these students then excel in the best companies. During the winter training session, the students will get a chance to ask queries and also they get the presentation session so that then they can raise their questions and get complete training without any doubts left in the mind. Just an FYI, BR Brains is starting winter training in the month of September 2018. The admissions are based on the method First in First Out. So hurry up and grab the opportunity to get into a job after training.